Note: These plans consist of a booklet of 4 pages of written instructions on 8.5" x 11" pages plus an 18" x 24" drawing. The printed version is black and white. The PDF file for instant download has color photographs. To save $10 and postage costs choose the download option below. 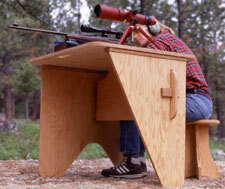 This is a portable, folding shooting bench that can be built in a three or four-legged configeration and modified to suit your own needs. It can be built in a lightweight or heavy duty version, and can be finished either plain, varnished or painted. 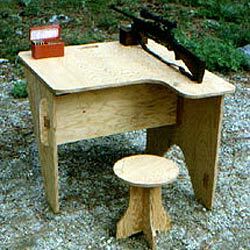 Use a handy stump for seating or build the small stool from plywood scraps. Plans include nicely illustrated blueprint and two pages of detailed step-by-step instruction.